Warren grew up in Oklahoma, and she’s never forgotten how difficult it was for her mother and father to hold on at the ragged edge of the middle class. An educational system that offered opportunities for all made it possible for her to achieve her dream of going to college, becoming a teacher, and, later, attending law school. But now, for many, these kinds of opportunities are gone, and a government that once looked out for working families is instead captive to the rich and powerful. More than seventy-five years ago, President Franklin Roosevelt and his New Deal ushered in an age of widespread prosperity; in the 1980s, President Ronald Reagan reversed course and sold the country on the disastrous fiction called trickle-down economics. Now, with the election of Donald Trump—a con artist who promised to drain the swamp of special interests and then surrounded himself with billionaires and lobbyists—the middle class is being pushed ever closer to collapse. Written in the candid, high-spirited voice that is Warren’s trademark, This Fight Is Our Fight tells eye-opening stories about her battles in the Senate and vividly describes the experiences of hard-working Americans who have too often been given the short end of the stick. Elizabeth Warren has had enough of phony promises and a government that no longer serves its people—she won’t sit down, she won’t be silenced, and she will fight back. 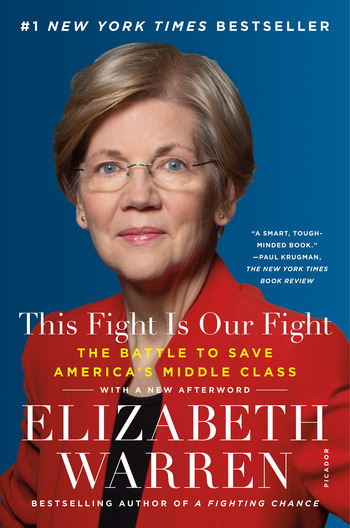 Elizabeth Warren, one of the nation’s most influential progressives and a longtime champion of working families and the middle class, is the senior senator from Massachusetts. A former Harvard Law School professor, she is the author of ten previous books, including A Fighting Chance, a national bestseller that received widespread critical acclaim. The mother of two and grandmother of three, she lives in Cambridge, Massachusetts, with her husband, Bruce Mann.